What is that blue light you are shining in my child's mouth? Dentists are very gadget oriented. We love the newest gizmos some of which are valuable to our clinical practice and some which are not. One of the advances in modern dentistry is the advent of light cured composite restorative materials (in other words-white fillings). The filling material starts out like a putty like substance you place and contour into the cavity preperation. You shine this blue looking curing light onto the material. This causes a polymerization reaction and makes the material get as hard as a rock (harder really) in just a few seconds. The light is not an ultraviolet light or a laser. Originally, they were a really bright projector bulbs with a loud cooling fan, cords and everything. Now the newer ones are wireless LED's which do not produce much heat. The light travels down a fiberoptic glass bundle to the tooth. (That's the curved rod looking thing). I think most of the cost of the things is making the fiber-optics. They also have reduced the curing times by adjusting the frequency of the light to match the chemical in the material that initiates the reaction-roughly 470nm. Curing times used to be about 40 seconds. The most recent one claims a 5 second cure. That seems a little too short for me, but we will see. They make the thing beep every 10 seconds or so as a timer, so you might hear a mysterious "beep" noise while in the dental office. For all this fancy technology, I tell the kids it's a flashlight, (which it pretty much is). 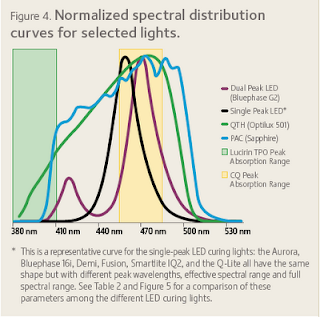 Light frequency distribution chart courtesy ADA Professional Products Review Vol. 4 Issue 4 2009. Labels: Business, Dental Development and Pathology, Fillings Crowns etc. 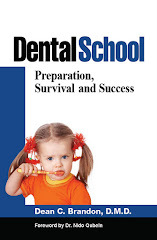 I am a freshman in college and I dream of becoming a Pediatric Dentist. Now that I think of it I have wanted to be a dentist since I was a little girl. Since my senior year in High School I have been trying to look up information on how to begin my path to dentistry, unfortuantly all the web sites I have looked at only tell me how much money they make. I don't care about the money. I really want to be a dentist but I need help figuring out where and how to start. Right now I am only doing my basics at a Community College in Texas. I think I really need your help. Could you please email me? Maybe you can find some more information here on the blog. I have a lot of stuff on dental school and becoming a dentist--(don't forget to read the comments too)! Nice work with your website. I'm a dentist and I've just been invited to an interview for admission into pediatric dentistry!! 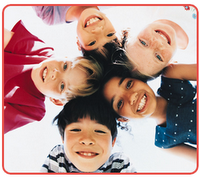 I'm so nervous, it's all I can do to keep googling pediatric dentistry and that's how I came across your website. Did you experienced with some dental curing light which rouse temperature on the tip of the light guide about 148ºF? The ones we use, if you put your finger on the tip, it is warm but not hot. The duration of cure is usually no more than 30 seconds anyways. I am a product designer in my final year in my college course in Dublin, Ireland. I came commenting in the hope that you might has some really useful information on the curing lights. I am in the middle of my research and am finding it difficult to find any statistics on the number or % of patients that have post operative sensitivity due to uneven curing due to the positioning of the unit during operation. Some other information I am trying very hard to find is if it is a common problems for dentists to position these units at the correct 90 degree angle to ensure for a full and even cure. This is important info for my research as I must validate my field and I intent of improving the current units. Any information would be very appreciated. Aaron, I am sorry I do not have immediate access to scientific studies of the kind you have mentioned regarding dental curing lights.